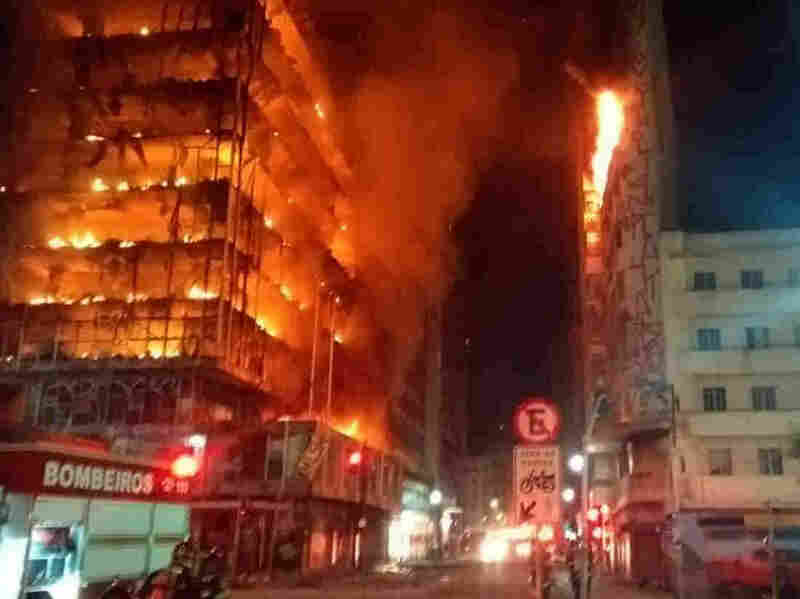 High-Rise In Brazil Collapses After Massive Fire : The Two-Way At least one person died in the building, which was an abandoned headquarters of the federal police occupied by squatters. In this photo released by Sao Paulo Fire Department, a building on fire is seen in Sao Paulo, Brazil, on Tuesday. About 150 firefighters were battling the blaze, which started at about 1:30 a.m. local time. It is thought to have been caused by a gas explosion, according to reports. About 50 families had lived as squatters in the building since it was abandoned as the headquarters of the federal police, reports said. Firefighters said at least one person died in the collapse, according to The Associated Press. Romulo de Souza, 49, tells the AP that he was among the squatters in the building, which he said caught fire on the fourth floor. He said most people got out. "Happily the majority got out," he said, adding that residents believed the fire may have been started by a gas leak.